← ABUSERS – TAKE A LOOK AT YOURSELF! October is Domestic Violence Awareness Month. Another foundation that shares the month of October is Breast Cancer Awareness Month – both causes are equally important. This post is dedicated to listing events and links that highlight activities going on this month. For the most part, the events happen yearly. If there is an important event that you would like to add to this post, please feel free to do so in the comment section. The list will be updated when I find more useful links. Click here to submit a name for the Remember My Name project electronically. NCADV honors those who have lost their lives to domestic violence. Please click here to enter the memorial. Save lives and help the environment–donate your unwanted cell phones and digital electronics to NCADV. A listing of events in different areas of the US. 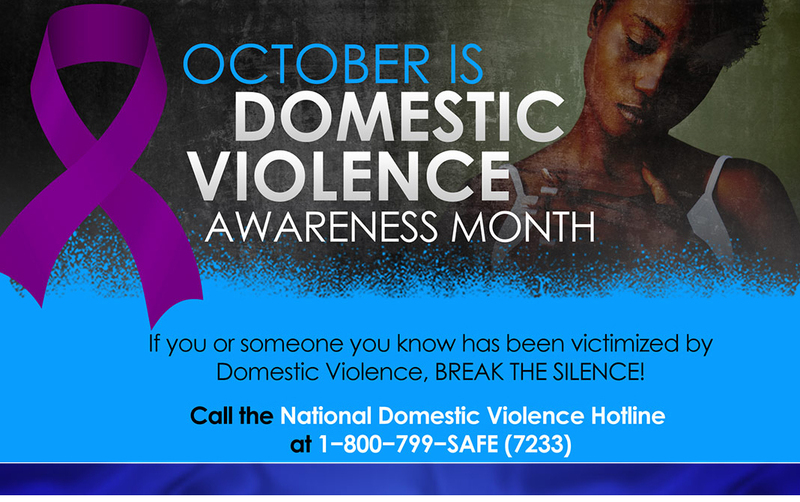 Here are some of the October events in the area to promote Domestic Violence Awareness Month. ■ A “Take Back the Night” March and Candlelight Vigil was Tuesday at the University of North Florida. ■ 19th annual Barbara Ann Campbell Memorial Breakfast, 7:30 to 9 a.m. Thursday, Hyatt Regency Jacksonville Riverfront Hotel, www.hubbardhouse.org. ■ Thrill the World, 9 p.m. Oct. 26, an attempt to break the record for zombies dancing to “Thriller,” www.thrilltheworld.com. ■ Quigley House Purple Ribbon Golf Tournament, 1 p.m. Oct. 17, Fleming Island Golf Club, 2260 Town Center Blvd., www.quigleyhouse.org. ■ Micah’s Place Appreciation and Awareness Breakfast, 7:30 a.m. Wednesday, Fernandina Beach Golf Course, 2800 Bill Melton Road, www.micahsplace.org. ■ Betty Griffin House Runway to Safety Fashion Show, 11 a.m. to 2 p.m. Oct. 29, Marriott Sawgrass, 1000 PGA Tour Blvd., Ponte Vedra Beach, www.bettygriffinhouse.org. Clerk of Courts – “Be Aware” event 11:30am – 1:00pm Topic: “Stalking” to be held in the Jury Room at 201 SE 6th St. for more information & RSVP please contact Tgreen@browardclerk.org. Florida Bar Association – “Domestic Violence CLE” 8:15am – 4:45pm on Wednesday, October 9th at the Hyatt Pier 66 in Ft. Lauderdale. For more information contact the Florida Bar Association. Click here. Jewish Federation of Broward – Luncheon & Fashion Show – Sunday, October 20th, 2013 for the 8th Annual KOLOT Luncheon & Fashion Show at the Signature Grand, Davie. Click here for more information. NOVA University – Documentary Screening and Q&A titled “No Way Out But One” from 2:00 pm- 4:00 pm & 5:30 pm-7:30 pm on Wednesday, October 23rd in Knight Auditorium located in the DeSantis Building. Click here for more information. General Federation of Women’s Clubs – “United Against Domestic Violence” A Taste of Italy Event” to be held at Gino’s Italian Market, Friday, October 25th at 7:00 pm- 5729 Johnson Street, Hollywood, FL. Mozzarella making demo, pasta stations, wine tasting, and more. Click here for more Information. The Annual Candlelight Vigil will be held 6:15p, Thurs., Oct. 24th, 2013 at John Dam Plaza in Richland, WA. Posted by ssofdv on October 2, 2013 in SPEAK UP! SPEAK OUT! Join us for our 22nd Annual Candlelight Vigil commemorating Domestic Violence Awareness Month. This event honors those lost, celebrates those who have survived, and asks our community to renew their dedication to ending violence against women. More information coming soon.